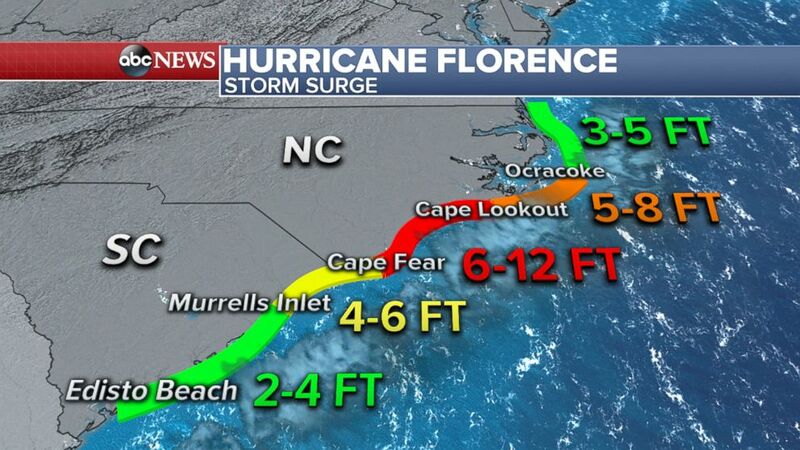 Hurricane Florence, a powerful Category 4 storm moving closer to North and South Carolina, will bring wind and waves that may be "nothing like you’ve ever seen," North Carolina Gov. Ray Cooper said Tuesday. "This storm is a monster," Cooper told reporters at a news conference. "It’s big and it’s vicious. It is an extremely dangerous, life threatening, historic hurricane." 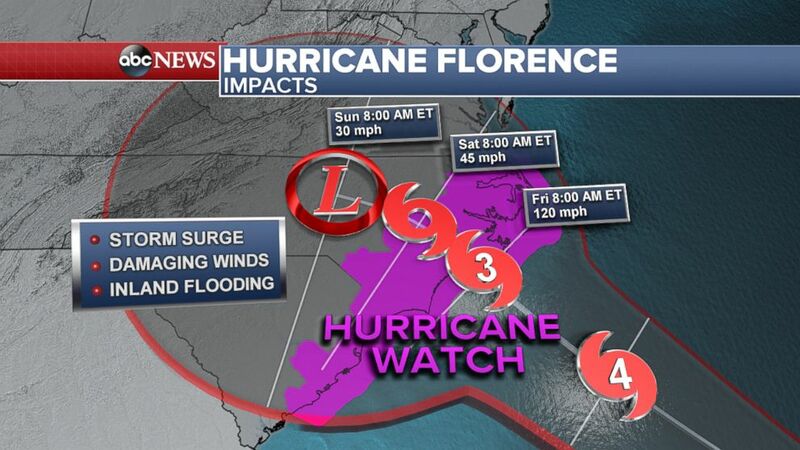 "This will likely be the storm of a lifetime for portions of the Carolina coast," the National Weather Service spokesperson in Wilmington said Tuesday night. "I can't emphasize enough the potential for unbelievable damage from wind, storm surge, and inland flooding with this storm." The storm is forecast to make landfall early morning Friday between midnight and 5 a.m. as a major hurricane. FEMA administrator Brock Long warned that power could be knocked out for weeks. 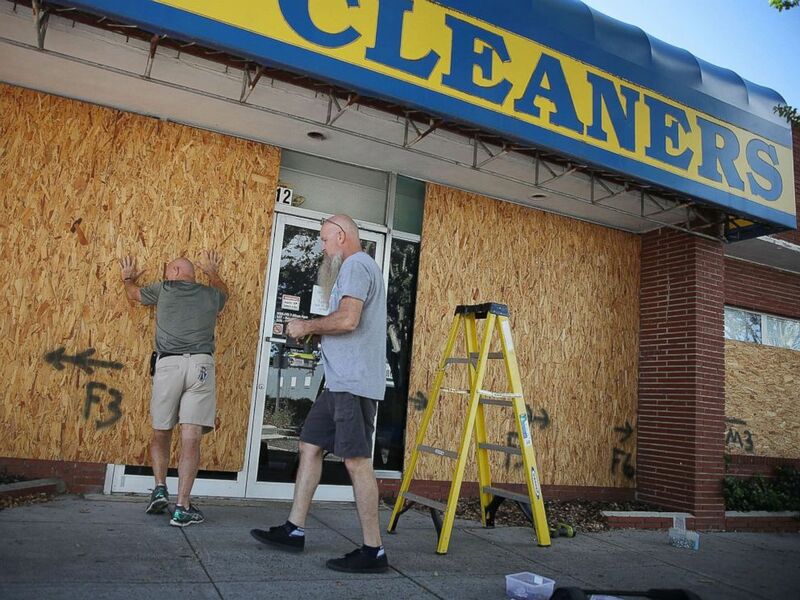 The U.S. Department of Health and Human Services declared a public health emergency in North Carolina and South Carolina on Tuesday. “These actions help ensure that Americans who rely on Medicare and Medicaid have continuous access to the care they need when the storm makes landfall,” said HHS Secretary Alex M. Azar. One serious danger is flooding. 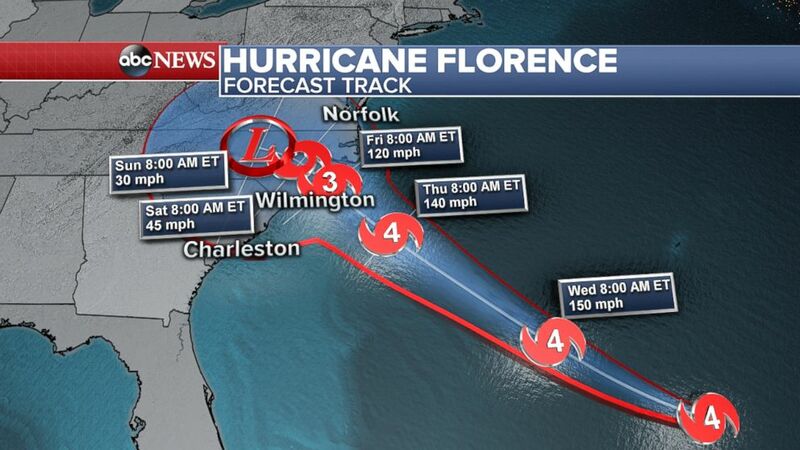 "All the predictions are when it gets to the coast it’ll be moving slow so it’ll be dumping rain on us and North Carolina for a long time," South Carolina Gov. Henry McMaster told "Good Morning America” Tuesday. 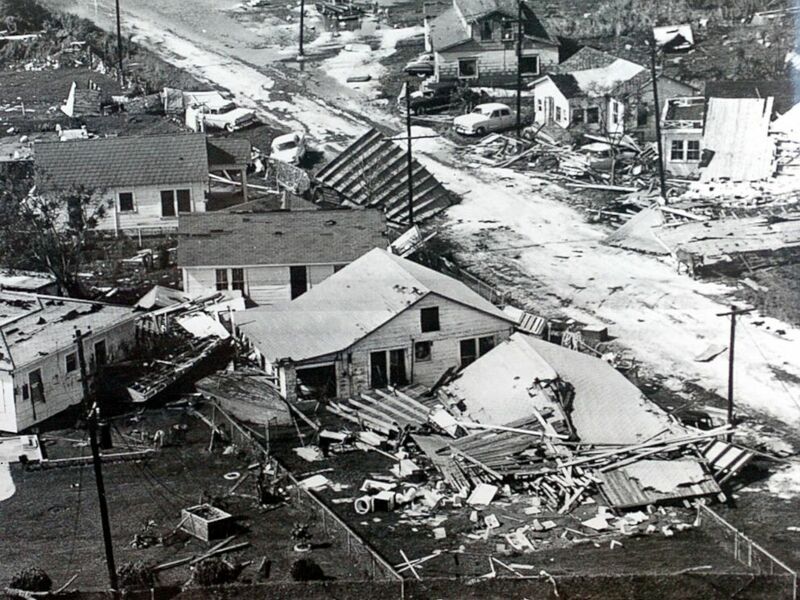 "This hurricane is big and strong and it’s bigger than Hurricane Hugo, which we had back in 1989." Heavy rain could flood hog manure pits and industrial sites in North Carolina, according to the Associated Press. That tainted water could wash into houses, and affect drinking water. 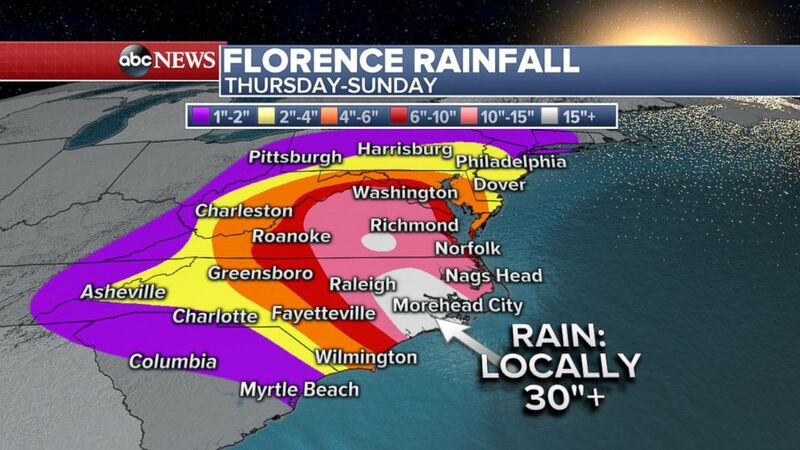 North Carolina and Virginia could get up to 30 inches of rain while Richmond, Virginia, and Washington, D.C., could see more than 10 inches of rain. 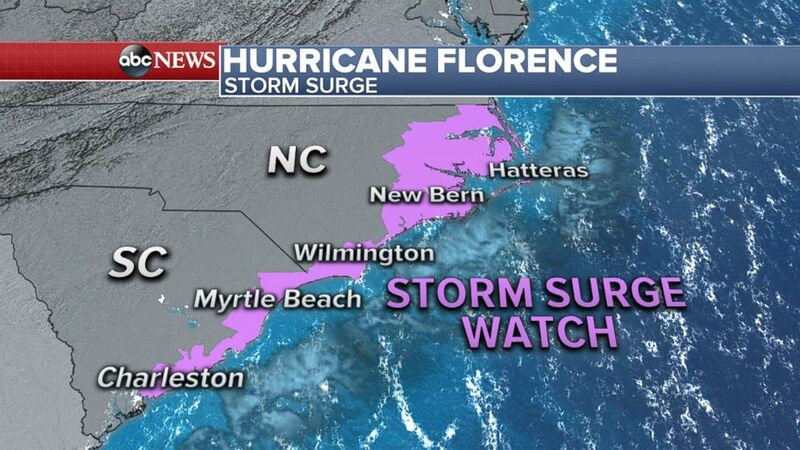 As the storm churns ahead with 130 mph winds, states of emergency have been declared in South Carolina, North Carolina, Virginia and Maryland and Washington, D.C. Residents and visitors on South Carolina's coast were ordered to evacuate Tuesday. 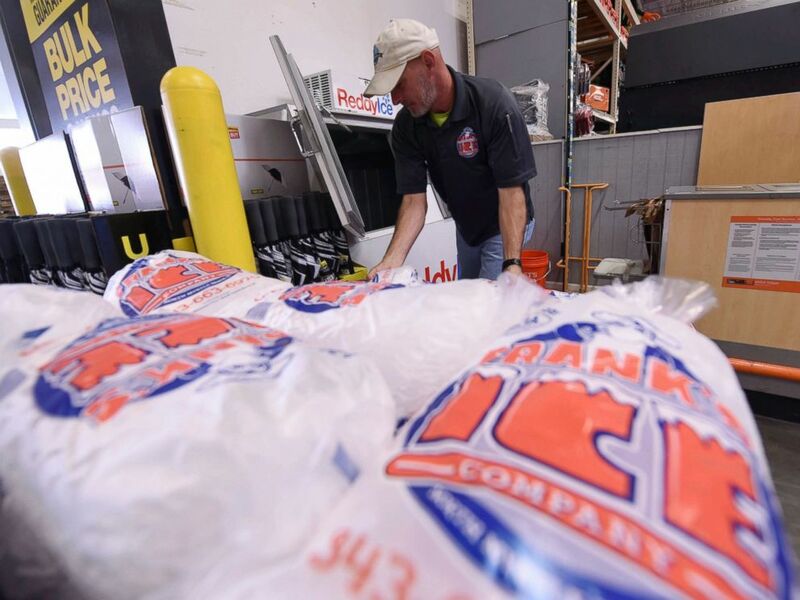 Mike Herring with Frank's Ice Company unloads another pallet of ice as people buy supplies at The Home Depot on Monday, Sept. 10, 2018, in Wilmington, N.C.
Boeing is suspending its operations in South Carolina because of the storm threat. 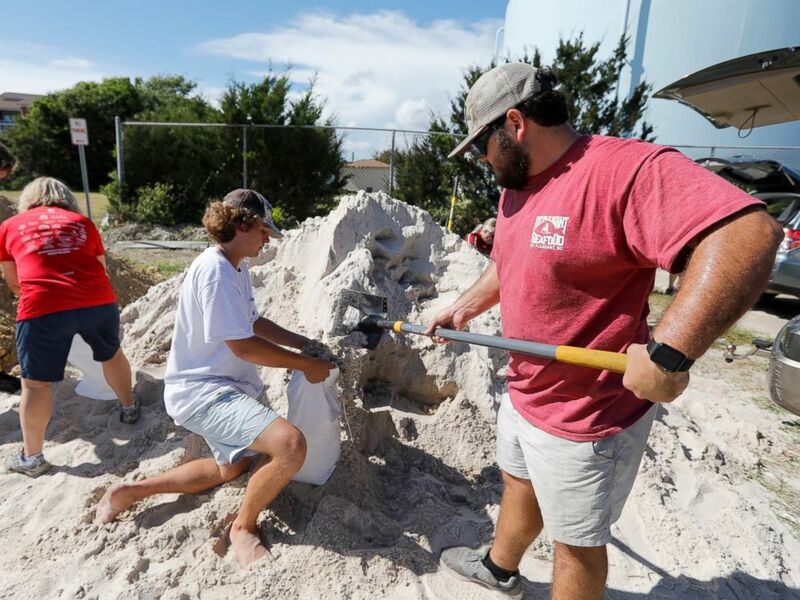 Walker Townsend, at right, from the Isle of Palms, S.C., fills a sand bag while Dalton Trout, in center, holds the bag at the Isle of Palms municipal lot in preparation for Hurricane Florence at the Isle of Palms S.C., Monday, Sept. 10, 2018.